Music means the world to me. It's part of who I am. It's part of how I think and communicate. It's part of how I live. But there would be no music inside of me without the conduit of radio. Radio has been a big influence on me since I was little. I am writing to you today to speak about the nonprofit that I have volunteered with since 2009 and has kept the spirit of radio alive - Asheville FM. This Saturday, October 31, Asheville FM launched their first on-air fund drive which ends on November 6th. I am asking you to help contribute to this wonderful volunteer-run, community-minded non-profit that I call my second home. Asheville FM has been an online radio station since September 2009. The show I host and produce, The UnCola, debuted during the first week and has aired ever since. We have reached listeners around the world on 6 continents. Antarctica, you're next. In 2014, Asheville FM was granted a license by the FCC to broadcast on the FM airwaves and began the year long process of fundraising and construction of our tower on top of the Hotel Indigo in downtown Asheville. The UnCola made its FM debut this year on May 19th. It was so exciting to know up to 100,000 people who live, work and visit in Asheville, NC and Buncombe County could be listening. Our goal is add to and reflect the rich stew of arts, culture and community involvement that is Asheville. We currently have over 60 original, locally-curated shows which range from jazz and comedy, pop and potery, rock and sports talk, world music and soul, blues and kid's shows, hip hop and health, politics and dance music, even old school country and anarchist journalism. We also feature live simulcasts of touring bands and community meetings. We also air an original news show on Mondays and Thursday which reports on local issues with spotlights on local non-profits and community causes. You can be a part of this project by supporting community radio with me! 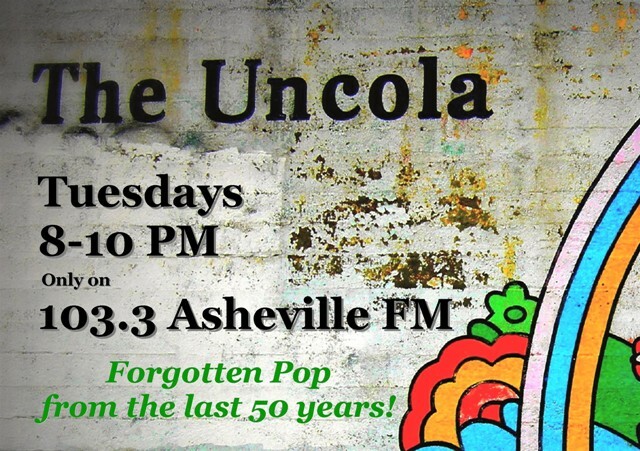 My show, The UnCola, airs each Tuesday at 8PM and we play forgotten pop from the last 40 years. We can boast of classic fans such as Graham Parker, Mark King of Level 42, GrahamGouldman of 10cc to newer artists such as Geyster, Norwegian Fords and StateCows. Because of our freedom to format our own content, I am able to play artists you will never hear anywhere else on radio. To date we have played 6906 songs by 2224 different artists. This is your chance to be a part of the community that is 103.3 Asheville FM. We are looking to raise $8000 and you can donate as little as $5 or much as your generous heart has to offer. When you make your donation, please write The UnCola in the notes section or memo line. Join us and be one of the first donors during our inaugural Fall Fund Drive! · Stop by our studios between 8AM-8PM Monday through Friday for a tour, meet our awesome team and check out our dollar record bins! · Mail your donation to the studios: AshevilleFM, 864 Haywood Rd, Asheville, NC 28806.